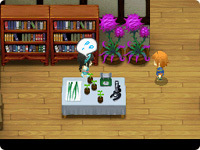 One of the things you can do in Harvest Moon is get married and part of the requirements for marriage is to see flower events; unless you're trying to marry Dirk or Alisa, who don't have any flower events. Blue flower event: Friendship is at a blue flower color (20,000 FP) or higher and you've seen the purple flower event. Green flower event: Friendship is at a green flower color (30,000 FP) or higher and you've seen the blue flower event. Yellow flower event: Friendship is at a yellow flower color (40,000 FP) or higher and you've seen the green flower event. Mikhail and the Oracle don't have colored flowers on their conversation dialog boxes, but they still have visible friendship point levels. For example, instead of two purple flowers, you will have two white flowers. The flower events trigger at the point where you ask the person out on a date and you select the correct date location. Instead of viewing the standard date conversation scene, the flower event will trigger. You need to ask for the date on the day and time that the flower event is available for viewing and select the correct date location. For example, one of the opportunities to ask for a date with Hiro is on Fridays between 11:00 am and 8:00 pm, where he will give you a random choice of three locations. If you want to see his purple flower event, Hiro needs to have purple flowers (or a higher color) and you have to ask him for a date between 11:00 am and 2:00 pm. If you ask him after 2pm, then you will just trigger a normal date scene and not possibly the flower event. When you ask Hiro during the correct time frame, he will ask you to pick one of three locations to go on your date. His purple flower event occurs at Yun's Tea House so if that is one of your random three locations, then select that spot and you'll trigger the flower event. If you don't get prompted to go to Yun's Tea House, then you can't see the flower event and you'll just have a normal date scene. You will have to try again the next available Friday to see his purple flower event. if you really want to see his flower event, then you can reload your last save game and ask him for a date again during the correct time. The three random date locations are generated at the point when you are prompted to select a date location, so reloading your saved game could get you three new locations.